I thought it might be a good idea to start a thread about our modifications. For my FIRST modification I thought I would tackle something really easy and quick. So I focused in on a couple of coat hooks on the vertical uprights (pvc) at the front corners of the changing area. By sanding down the joints slightly it makes them very easy to position at whatever ankle suits your needs, coats, helmet, lights, whatever. You could also put a cap on it for a finished look but I chose to keep it open in case I wanted to use the upright hole to put a light of some sort in. Mine fit over my extension painter's poles. Hey Ken, are those lose enough on the pole to swivel? Hey Ken, I would like to know how you made (or where you purchased) your light sticks/tubes? Did you insert the strips into the plastic tubes like G Wiz or did you do something different? Also, what is it that you used to attach the tubes to the ridge poles? They are held to the ridge poles with a pair of plastic coated metal spring clips (that are attached to the pole with a small nut and bolt) and the centre is held to the contour of the pole halfway along the pole's length with a modified plastic Christmas icicle eavestrough hanger. For the LED lights inside I just bought a light rope and Zip tied it to the roof bow in the center. It stayed in place all the time, just leave it there when folding the camper and it was no problem at all. We also prefereed to use an air bed as the matress that came in it was much too thin, I sleep on my side and my hip would be hitting on the deck. The air bed worked well because it would deflate to where it was no problem to fold the camper yet was nice and thick and as hard or soft as we wanted it. A coleman battery powered pump fills it in just a few minutes. I did something a bit different for a cooler, I bought one of the 12 volt coolers and put it inside the camper, wired 12 volts to a lighter plug inside under the bed. Then I bought an action packer plastic box that fit the ice chest rack on the front. That box got all of the stuff that would be wet or dirty. The ground cloth, entrance rug, hatchet, tent stakes, electric cord, portable Grill, and other things like that. It helped to keep the main storage area a lot cleaner. I bought some small decorative chain, cut two pieces about 6 inches long and screwed them to the camper near where the clips are that hold the top closed. Attached the clips for the top to the chains. Never lost a clip after that. 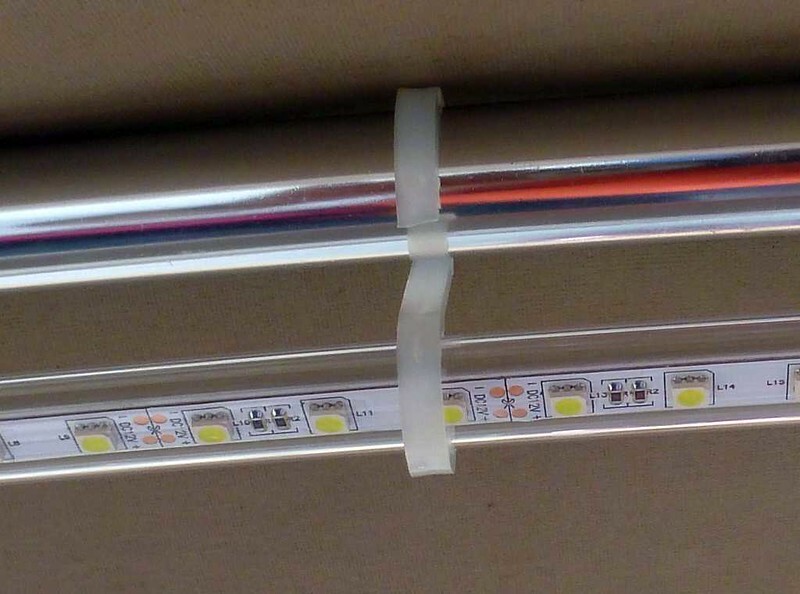 I ordered some LED strips (2 different kinds) and some of the CCTV components (connectors, switches, etc) from Amazon to put together this light mod. Parts should be here tomorrow and I might have this completed over this long holiday weekend before our trip to VA.
Light Modification update: All of the ordered parts came in yesterday (CCTV components, LED strips) and I went to Lowe's last night to see if I could find the tube, tube caps and clips. I ending up downsizng the clear tube to one that is 1/2 inch OD and 3/8 inch ID ($.35 per foot and I got 10 feet). The led strip is a snug fit but goes in well if you pull it through with a feeder wire. I am in hopes that there is not any heat build up inside the tube. I found white caps for this exact size (2 for $1.04) and also some white brackets ($1.04 for an 8 pack) that can be placed at 3 points along the overhead bar with screws from side to side rather than top to bottom which keeps the screw head off the canvas. I also decided to put in two switches (one for each light strip). One switch will be accessable from the bed area and the other switch from near the entrance. Seemed to make sense to me. I'll take some pictures and add them here this evening. Now, I need a battery and the associated wiring to make this functional. Don't forget a Battery Tender John!! Yep, got the battery tender all set, just need a small light weight battery that can supply enough power for the lights for a reasonable amount of time. I have my old motorcycle battery but I'm not sure that it will even hold a charge any more. Recommendations are appreciated! I stored/carried it in an old video camera bag, but since I had the room I ordered an extra battery, hooked them up in parallel, giving me longer run time. I use a weatherproof Battery Tender JR connected to a couple of pigtails on the batteries to charge the batteries while at a site with electric. Crap dusty, where was this stuff posted? I was flying blind I guess. Some of it over on MC and the rest I posted here before the old forum posts got deep sixed! and the rest I posted here before the old forum posts got deep sixed! Looks like I made some low cost errors in the mod, not too late though. What is the purpose of the aluminum backing and what is it (source)? You could buy one of those jumer packs that have a lighter socket and a charger built in. Then when not using the camper it is very easy to remove to plug it in to keep it charged or to use for other things if need be. 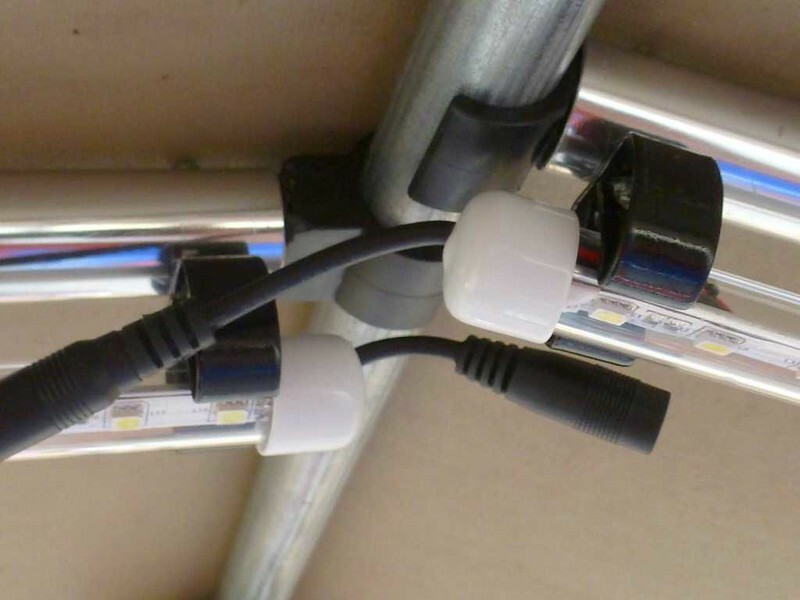 Instead of the solar panel, you can use a relay and the sixth prong of the trailer plug (if you have the 6 square) and run a 12 volt accessory lead from the bike to the trailer and let the bike charge it while you drive. Worked good on my 1500 with the comp u fire alternator. Using the relay will cut off the connection when the bike is off so the trailer can't draw the bike battery down. I use the 6th wire to power the brake controller on the tongue and also charge the battery. The voltage test with the bike running shows near 14v at the battery so it is being charged. We have a 51 AH battery due to our requirements. I also installed a common 30 amp relay up at the bikes battery wired so it opens up when the key is turned off. That way all electrical requirements at the trailer will be strictly off the trailer battery. The respiratory guy was here to check my O2 concentrator Wednesday. I mentioned how finding a power plug for my Brides C-Pap machine so we can plug in into the trailer 12v system. He looked at it and said "Looks to me like the P/S is trying to fail." The next day he delivered a new P/S. So now I have a plug and a 5 amp charger. Lighting update: well I didn't do the lighting exactly as Dusty and G_Wiz had instructed but I did get them up and functional for the upcoming trip. I used smaller and less expensive tubing, mine was 1/2 inch OD 3/8 inch ID (.39 per foot). This was not a good choice for a couple of reasons. The LEDs fit too tightly and tended to bunch up, I did not have room to clue the lights to a solid 1/2 bar of aluminum for rigidity (I ended up using vinyl coated copper wire which helped but was far from perfect). Because of the smaller tubing I was able to use a standard plastic 1/2 inch clamp ($1.04 per 10 pack) which I mounted onto the side of the ridge poles. Yes, I know, I need to trim off the excess bolt threads. The 2.1mm X 5.5mm DC connectors are very reasonable in price (Amazon) so I got a couple different types to try them out hooking them up to the LED strips. I first tried the snap connectors, they worked well for the connection however they would not fit in my Â½ tube. I then went to the solder type connection and I liked this the best. So solder with heat shrink was how I eventually went. I also purchased three types of switches, a simple toggle switch (2 at $5.49 each), a dimmer switch (2 at $6.99 each) and a remote RF switch (1 at $6.55). The beauty of these things are that can be plugged into any circuit you want because of the standard connectors (male/female plugs) being used. The toggle switch may have its uses however I found that the dimmer is probably the most versatile. That being said, I REALLY like the remote control unit! Not only will it turn the lights on or off from a short distance it will allow you to dim them in steps and even allow you to change â€œmodesâ€. Nancy said the strobes made her dizzy! I still havenâ€™t seen them all yet but suffice it to say that it is really cool! Power: I got my hands on a nice little AGM battery that fit into my plastic ammo case real nice with lots of room to spare. I fused it with an inline fuse and fashioned a temporary pigtail to it with 3 connectors to mate up to my lights. This coming trip to the NAGN M&G in VA will make for a good trial run with the lights and hook ups. I will have a better idea of what I might want to change or improve upon. As long as it works to your satisfaction, that's all that counts, John! The connectors are very reasonable in price so I got a couple different types to try them out. I first tried the snap connectors, they worked well for the connection however they would not fit in my Â½ tube. I then went to the solder type connection and I liked this the best. So solder with heat shrink was how I eventually went. I also purchased three types of switches, a simple toggle switch ($5.49), a dimmer switch ($6.99) and a remote RF switch ($6.55). The beauty of these things are that can be plugged into any circuit you want because of the standard connectors (male/female plugs) being used. The toggle switch may have its uses however I found that the dimmer is probably the most versatile. That being said, I REALLY like the remote control unit! Not only will it turn the lights on or off from a distance it will allow you to dim them in steps and even allow you to change â€œmodesâ€. I still havenâ€™t seen them all yet but suffice it to say that it is really cool! The lights/battery setup worked well and was very easy to connect up once the trailer tent was opened up. I have noted a few things that I want to change. The AGM battery did just fine for 3 nights without a re-charge (only powering the lights). The light strips did indeed twist inside the tubes. I will be replacing them with a 3/4 inch O.D. tube (5/8 inch I.D.) as soon as possible and including the 1/2 inch AL bar that George and Dusty recommended. I can probably re-use the light strips. I liked the soft white glow of the lights, it was a good choice. I will be making the installation a bit more permanent by drilling a hole in the bedboard to allow the wiring to come up through from the battery stored below (this trip I just placed the battery/case on top of the bedboard). I will be putting the two light strips on two different circuits (one with an on/off/dimmer switch velcro'd to the upright poles in the changing room near the front door and the other on the remote control device). The beauty of this installation is that it is very configurable by plugging in whatever mechanism you want (toggle, dimmer or remote). I am considering making up a light strip for the outside doorway area as well. Need to install a cigarette lighter plug to access the 12V from the battery for charging phones via USB. Nancy will be making us a custom cloth bag with drawstring to hold the ridge/light poles and another for the changing room and outside poles to help keep them organized and protected when packed. Some great ideas John. I have a 4' LED light string that is populated with a bunch of water proofed LEDs. Just am not as happy as I thought I would be with the light spread inside the camper. So do not have them up yet. Need to find lights like you did. Have thought about a 16' roll of those remote controlled color changing lights to put up outside. Also we are looking for one of those canvas collapsible shelve things. Would be a great place and much more convenient for all of the chargers and electronics to be placed at night.